From left: Parents Miguel Montalvo Margarita Perez, Park City High School students Alexis Montalvo Vicente Flores, and Jeff Statler and Maureen Amendola met two weeks ago to show Statler, associate professor of chemistry at the University of Utah, the work of Montalvo and Flores. The two students will be attending a chemistry program at the university this summer. Most students dread doing their chemistry homework. But two sophomores at Park City High School love the subject so much they want to keep studying it all summer. The students, Vicente Flores and Alexis Montalvo, have been at the top of their chemistry class since school began last fall. 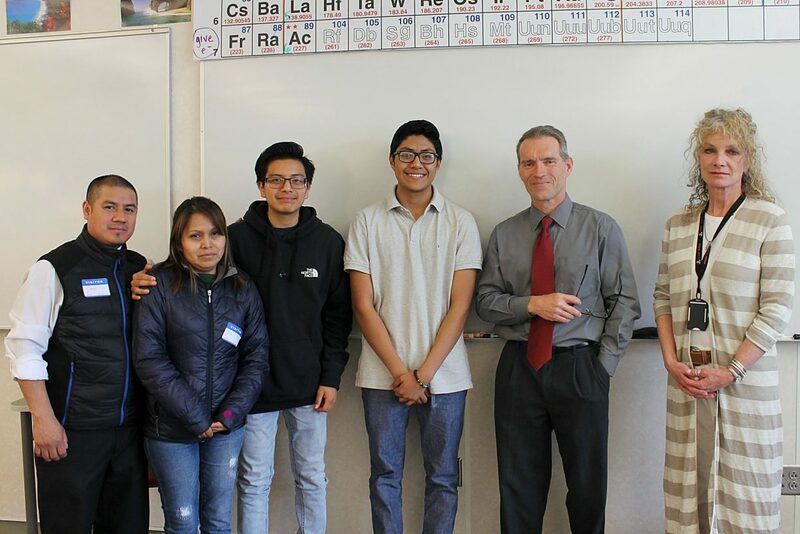 That is why their teacher, Maureen Amendola, recommended them for the Summer Chemistry Enrichment Program this year at the University of Utah. Thanks to fundraising help from the student group Latinos in Action, of which they are members, the students are ready to go. The program, which lasts six weeks, includes daily classes at the University of Utah. Those who complete the course will receive college credit. Flores and Montalvo were among a handful of students selected to go from Park City High. When Amendola told them that they were selected, they knew immediately that they wanted to go, but the cost of the program was a concern. When fellow members of Latinos in Action heard they needed help, they did not hesitate to hold a fundraiser so they could collect the money for Flores and Montalvo to go. After weeks of selling candy, gelatin and tamales around Park City, they had raised more than enough for the students to go. Flores said that having his classmates raise the money took the burden off of his family, which he is grateful for. “I felt really appreciated,” he said. Now that they will be going, the students can hardly wait for the course to begin. Montalvo is eager to learn more too. He said that he fell in love with the subject right away because chemistry can be observed in so many parts of life. Flores enjoys doing the math behind chemistry and then applying it. They both hope to pursue majors and careers involving chemistry, so having the program under their belts will ideally give them a leg up. Amendola quickly noticed their passion and abilities. She said that it is rare for students to get perfect or near-perfect scores on any of the tests, but that “their first exams were phenomenal.” Plus, she added, they help other students in the class understand the material. “You get (children who have) ability or aptitude in a certain subject matter, you get children who are well-raised and respectful, you get children who are hard working, you get children who care about other people, but they are all those things, which impresses me,” she said. Montalvo said that he was surprised that he was selected because there are several talented students in his class. This opportunity motivates him to keep excelling in academics. Flores said he feels the same. Members of the Silver Summit Academy’s elementary PTO say students have had recess in busy parking lots because the school does not have an established playground or outdoor area for the kids.